In recent blogs you will have noticed an ever increasing range of battery makes and technologies that are catered for and which integrate well with Victron Energy products. Examples of such products are Victron Quattros, Multis and MPPT solar charge controllers. The Aquion AHI batteries are 48V, and according to the manufacturer the safest batteries in the world; non-flammable, non-explosive, non-hazardous, and touch-safe. There are no heavy metals or toxic chemicals involved, making them very suitable for Energy Storage. Why add energy storage to a grid connected solar system? Countries around the world have many differing reasons and incentives to add Energy Storage Systems. This might be due to an unreliable grid, the opportunity to feed back to the grid with some countries being worthwhile financially to do so and others not. It can, therefore, make sense to utilise as much solar power as possible locally and not feedback or indeed draw from the grid, due to solar becoming more cost effective and more stable than grid energy. Consequently, if there is an excess of solar power it can effectively be wasted if not stored and used locally, rather than being fed back to the grid. This, of course, is where an Energy Storage System comes in. 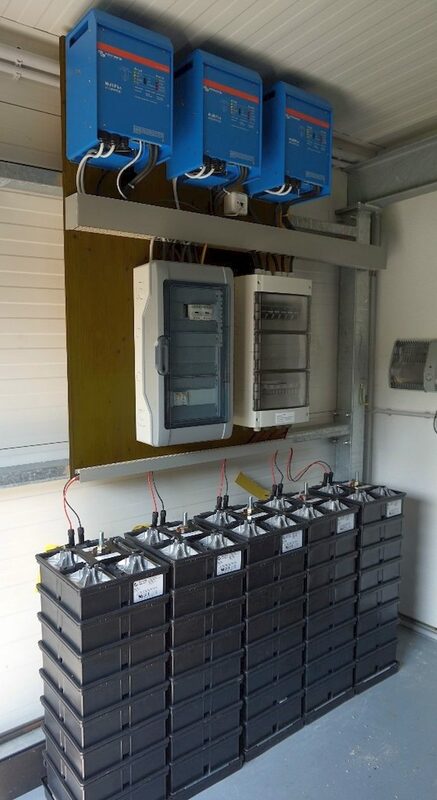 In considering the above we recently heard from BlueSky Energy, an Austrian company that have carried out various installations, integrating Aquion batteries with Victron Energy products. Here are two such examples. 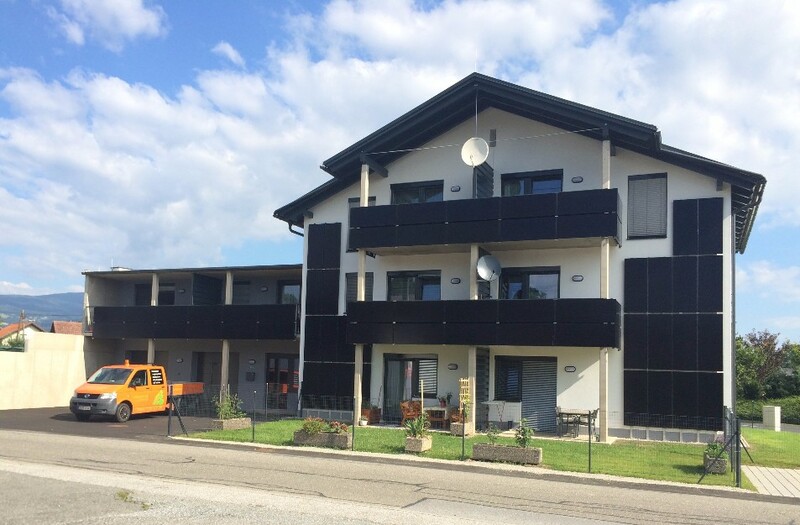 This 8 apartment building is in Frauental in the Austrian region of Styria and it is shown in the headline image of this blog, where you can see that the PV system is placed on the roof, the facade, and even the balconies of the building. This project is a showpiece in terms of self-consumption and increased self-sufficiency. The installed 30kWp photovoltaic system generates enough energy to heat and produce hot water for all of the 8 apartments, as well as enough to charge the Aquion batteries to ensure that all consumers are supplied by the battery stored solar power during the night hours. The project was implemented by BlueSky Energy and their partner Langmann Consulting. 3 x Victron MultiPlus inverters for 3-phase operation. Victron Color Control GX for system monitoring. 12 x Aquion S30 batteries with a power of 8.1kWp and a storage capacity from 21.6 to 25.9 kWh (depending on charge/discharge power). The installation shown below is a family home energy storage system in Groß St. Florian in the Steiermark region of Austria. Initially, this was a grid connected solar system but recently energy storage was added. The reasons for doing so become apparent when we look at the graphs below, taken from Victron’s VRM portal. 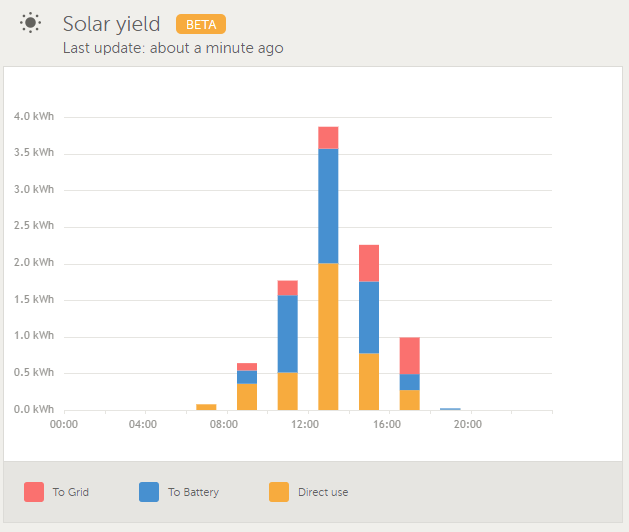 The graph in the example below is taken from this home system, showing solar energy production or yield and where that goes over a 24hr period, in 2 hour time slots. You’ll note that around a combined 92% of the yield is used directly by the home (yellow bars) and stored in the batteries (blue bars) for night-time use or times of low solar yield. Energy usage or home self-consumption and energy storage are therefore maximised, with only around 8% being fed back to the grid for the reasons discussed previously – such as poor grid feed-in rates or tariffs for example. In this graph below we can clearly see the benefits of adding an energy storage system. All the blue in the bars show that the house has been powered from the batteries. The self-sufficiency level of the house has increased to 70%, whereas without an energy storage system it would only be around 35%: the hours where PV production overlaps with demand. 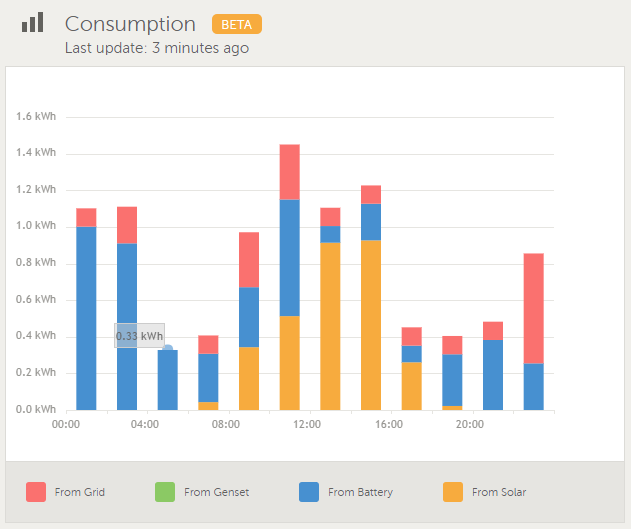 All in all the above graphs demonstrate very good reasons for installing this home energy storage system, the components of which are shown below. Switching device so that the PV system continues to operate during a power failure. DC Protection & Combiner Box. 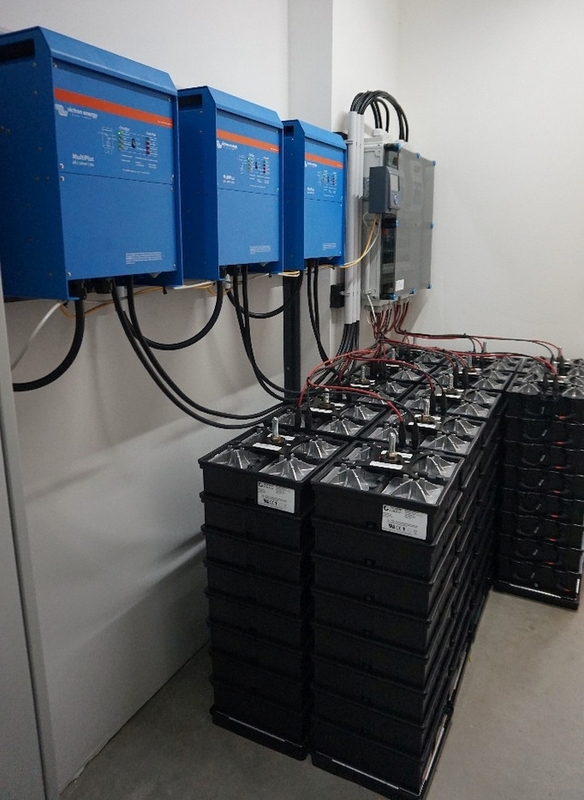 5 x Aquion S30 batteries with a power of 4kWp and a storage capacity of 8 to 13.2 kWh (depending on charge/discharge power). It’s good to see more and more Victron Energy products being used with differing battery energy storage technologies, along with confirmed product compatibility on both sides.